A sofa bed is one of the most versatile pieces of furniture you can get. It gives you the best of both worlds in a compact form. By getting two pieces of furniture for the price of one, you’ll end up saving money as well. Here are some of the best sofa beds in Singapore that you can buy in Singapore right now! If you are looking for a sofa bed that provides the highest level of comfort, get the HomeAndStyle Vernon Sofa Bed. 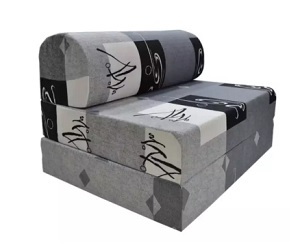 It is made with high-density foam that offers excellent support and comfort whether you are sitting on it or sleeping on it. With a birch wood inner structure, it is also sturdy and solid and is built to last. The sofa has dimensions of 210 cm length and 90 cm depth. When converted to a bed, it is 183 cm in length and 138 cm in depth. It is smaller than a full-sized bed but is still suitable for most people – 180 cm and below. We also like that it is effortless to be converted from a sofa to a bed – it only takes less than a minute. Additionally, it is a well-designed sofa bed. It has a beautiful exterior that exudes modernity. It will definitely be the centrepiece in your living room or bedroom. Its covers are also removable which is great for hygiene purposes. You can remove it and wash it once every few months to ensure cleanliness. If you are wondering whether you should buy a sofa bed online without trying it out first – this is the one you will not regret. 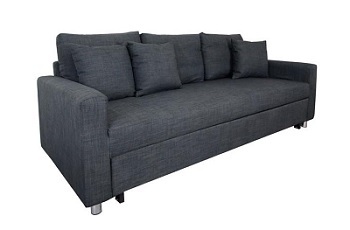 Click here to check out the latest price for the HomeAndStyle Vernon Sofa Bed on Lazada now! 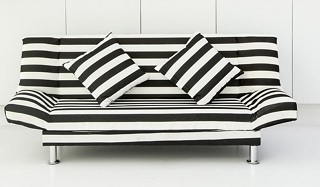 The Elvi PVC Sofa Bed is a great choice if you like a no fuss and easy-to-use sofa bed. It is very comfortable with a firmness level of around 6 to 7 for its seat and backrest. This firmness level is known as the Universal Comfort Level which means a large percentage of people will find it perfect for them. There will be no complaints from anyone sitting or sleeping on this sofa bed. With a PVC exterior, this sofa bed is extremely easy to take care of. You can use a semi-damp cloth to wipe it down every once in a while. The great thing about this is you don’t have to wait long for it to dry – a couple of minutes at most. This is the advantage a PVC exterior has over the usual cloth sofa beds. If you want a fuss-free sofa bed, the Elvi PVC Sofa Bed will be one of your top choices. 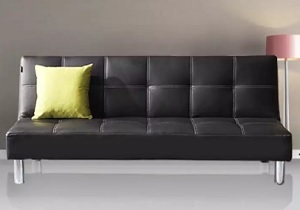 Click here to find out the latest price for the Elvi PVC Sofa Bed on Lazada today! Small, compact and yet comfortable, the Viro Sofa Bed fits just about anywhere – It is great if you do not have a lot of space to spare. It is a one-seater sofa which can also be used by two people if you don’t mind seating side-by-side. When converted to a bed, it has a nice headrest which can double up as a pillow. This is great if you’re using it mainly for guests staying a day or two. That way, you don’t have to buy an additional pillow which saves you money and time. The bed is thick which ensures sufficient support and comfort for a good night’s sleep. For a compact and affordable sofa bed, you have to consider the Viro Sofa Bed. Click here to find out the latest price for the Viro Sofa Bed on Lazada today! The stylish and functional Bradley Sofa Bed will definitely be a great addition to your home or office. There are 8 different colours that you can choose from – Red, Black, Blue, Brown, Grey, Orange, Pink and Purple. Regardless of which colour you want, it is sure to add a dash of style. Converting the Bradley Sofa Bed from a sofa to a bed is simple. You just have to push down the backrest and it will turn into a comfortable and spacious bed. The sofa bed is supported by chrome legs that can easily take weights of up to 150kg. The sofa bed is filled with high-density foam which has a medium-hard feel suitable for most people. A velvet outer layer will provide a feeling of softness and luxury as you lay down on it. You won’t regret getting this amazing sofa bed. 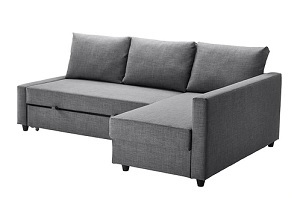 Click here to check the latest price of the Bradley Sofa Bed on Lazada today! This Single Foam Sofa Bed is a great no-frills size. It is not branded, so the price is really attractive as you do not need to pay a premium for marketing costs. It has a small footprint which means it can fit comfortably even in a smaller room. Importantly, it is a pretty comfortable sofa and bed with a nice firmness for back support as well. If you want a very value-for-money option, this is an excellent choice. 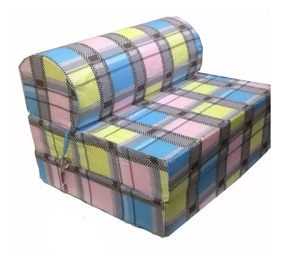 Click here to check the latest price of the Single Foam Sofa Bed on Lazada now! The Jones Sofa Bed is one of the best premium sofa beds that don’t break the bank. It is big enough for 2 to 3 people to sit comfortably. When converted to a bed, it can fit 2 average-sized adults if you don’t mind a little squeeze. It takes only seconds to change it from a sofa to a bed. Press down on the backrest and you’ll get to enjoy a comfortable and luxurious bed. It has a solid build that is guaranteed to be durable with birch wood foundations. It also comes with removable sofa covers that are washable. A great way to make sure your sofa bed is clean and sanitary. If you don’t mind spending a little more for a premium sofa bed, consider getting the Jones Sofa Bed. You will love it! Click here to check the latest price of the Jones Sofa Bed on Lazada now! Castlery is a well-known furniture brand in Singapore and it is no surprise that their sofa beds are excellent. The Porter sofa bed is a great option if you want to strike the right balance between price and quality. It is comfortable to sit and sleep on with the good combination of foam, spring and polyester. 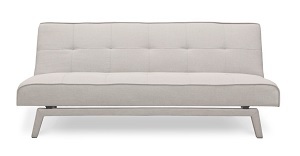 Also, the Porter sofa bed is very well-designed and exudes modernity and class. Seahorse Sofa Beds are as comfortable as their popular mattresses. You will expect nothing, but top-notch quality and Seahorse delivers. It is made with genuine leather which provides a smooth and luxurious surface to sit and sleep on. When converted to a bed, it is spacious enough to fit 2 adults easily. With a high-quality wood structure, you can expect this sofa bed to last for many years. The Ikea Friheten Sofa Bed is a super versatile piece of furniture – you can use it as a sofa, bed and even storage space. 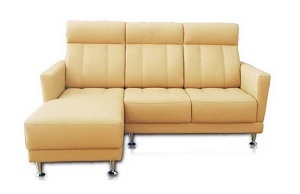 When in the sofa form, it can seat 3 to 4 people comfortably. When converted to a sofa, 2 adults can sleep on it with ample space remaining. When you lift up the sofa seat, you will find large storage spaces which are fantastic as an alternative storage solution. Before buying a sofa bed, there are a few questions that you should consider so that you can choose the right sofa bed for your needs. How often will it be used as a bed? The frequency of which the sofa bed is going to be used will strongly influence how good a sofa bed you are going to get. If the sofa bed is only to be used regularly daily, getting a higher-quality and more premium option will help make your sleep more comfortable and relaxing. If so, you should look at sofa beds that are at least $500 as a good night’s sleep is priceless. 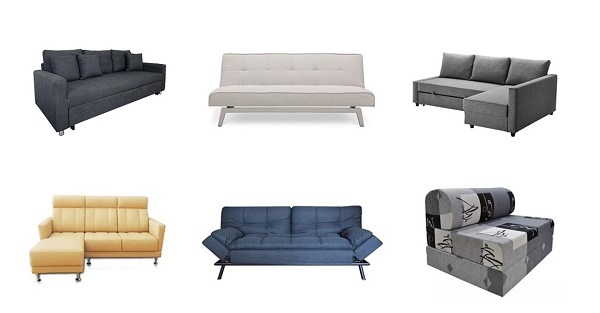 If the sofa bed is mostly going to be used as a sofa, perhaps you can choose one which is cheaper. If it is meant or guests who are only going to be sleeping on the bed once or twice a month, you won’t need to get such a premium sofa bed. In this case, a sofa bed that costs between $200 to $400 would be good enough. How much sitting and sleeping space is needed? When choosing a sofa bed, it is essential to know the amount of sofa and bed space you need. 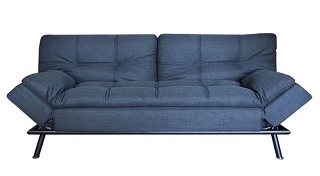 If you want to seat 3 people on the sofa comfortably, you will need to get a 3-seater sofa bed. Getting a 2-seater sofa bed and squeezing 3 people on it will be not a comfortable experience. You also need to consider the amount of space needed to sleep comfortably when converted to a bed. Most smaller sofa beds can only fit a single person. If you want to fit two people, you will have to buy one that states it is twin size. Otherwise, it will be a tight squeeze for the night. Do you have enough space for the sofa bed? Sofa beds are more compact and space-saving than the usual bed and mattress combo. However, they do still take up quite a bit of space, especially if you get the bigger sofa beds. To make sure you have sufficient space, you need to consider the space needed for both before and after conversion from a sofa to bed. The dimensions should be readily available online so do check before purchasing. Take a measuring tape and size up the available space in your room or home to decide what size of sofa bed you should get. Is the sofa bed easy to maintain? There are two types of sofa maintenance that you can choose from – removable sofa covers or wipeable sofa covers. Each has its own pros and cons. Removable sofa covers mean you can unzip it and put it in the washing machine for a thorough wash. It is the more hygienic and clean option. However, washing and drying it will take at least 1 to 2 days – which means the sofa bed is unusable during that time. On the other hand, wipeable sofa covers are convenient as there is virtually no downtime when you wipe them. At most, you only need to let it dry for an hour or two. Additionally, wiping it is much quicker and easier than washing it. However, the tradeoff is that it will not be as clean as the removable and washable sofa covers.